So Ms Office 2016 Has Launched and With the New Ms Office also Comes Errors. Today we are covering one such error Called asError 30015-6 (-1). This Error Code is Occurred while Installing MS office 2016. The Excitement of Using MS office 2016 comes to hold when Such errors bugs you on Installation Itself. But today We are here to help solve this Error 30015-6 (-1) for you. Without Taking much of your time lets jump on How to fix this. 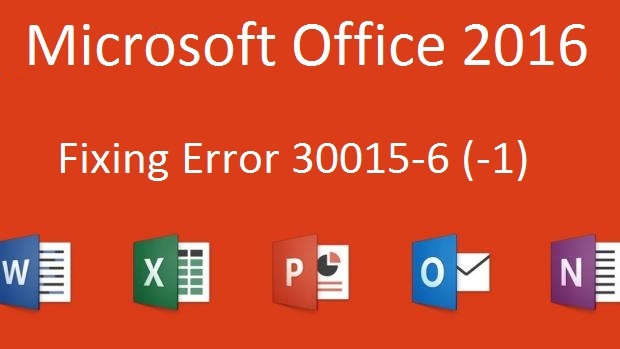 We will be Discussing 3 Methods to Fix this Error in Microsoft Office 2016. Perform Each one by one and hopefully you will be able to get rid of it. You should be Able to Install and Run the Program with ease. Search "Firewall" and Clicking on Windows Firewall. Now Click on "Turn Windows Firewall On or OFF" from the left pane. Now Select Turn off Windows Firewall in both Public and Private options. That is it. You have just turned off your Antivirus and Firewall which might well Conflict with the installation of programs some times. Now try and install office 2016, If you get the same error again then please look at Method 2 Below. In this Method we will Be Using Official Microsoft Office Troubleshooter to get rid of Error Code 30015-6 (-1). If you have already used the Troubleshooter then Skip this method and move on to Method 3. Once it is Done, Run the Tool and Try to Install MS office 2016 again. If you Don't get the error than Congrats, but if you still get the same Error 30015-6 (-1) While Installing then you should be Performing Method 3. Method 3: Installing in Clean Boot State. When you do Clean boot, you make sure no 3rd party service are enabled and you also make sure that nothing can conflict on your PC which Most probably Ensures that you will go Through your Installation without any hassle. But Before we Move ahead and see how to do Clean boot, you need to Manually Uninstall Office 2016 From your Computer. Step by Step Instructions on how to do this is listed on Official Website Here. So Now you need to Go through all the steps listed there and Come back here to know what more you will need to do to fix Error 30015-6 (-1). How to do Clean Boot? Ok, So i am hoping that you have successfully manually Uninstalled your Current version of Office and are now Ready to Clean boot your PC and Install Office 2016. Please follow below steps to Clean boot your PC. > A System Configuration Box should appear in front of your Screen. > On General tab, Check Selective Startup and Uncheck "Load Startup Items". > Now jump to Services tab and tick the box that says "Hide all Microsoft Services"
> Next you will see a list of Services which are 3rd party, so Click on Disable all. > Now Apply the changes and Click OK. You will be prompted to Restart your PC to make the changes. That is it, On Restart, you will have a Clean boot PC and now you are ready to Install Ms Office 2016. This Method should work in most cases to Resolve Error 30015-6 (-1). Once the installation is done, Don't Forget to make your PC boot normally again next time. Again perform the same steps and Tick Normal Startup in General tab this time.